Did you know? Nearly 1 in 5 Americans live with a disability. Goodwill of North Central West Virginia’s Assistive Technology Program can help your business connect with them to expand your customer base, strengthen your workforce, and enhance employee and customer satisfaction. Any business or employer is eligible to receive our service. Goodwill of North Central West Virginia provides consultations to help ensure that your facilities, goods, and services are accessible to customers and visitors of all abilities. Let us visit your site and review your business using the current Americans with Disabilities Act Standards for Accessible Design. Your organization needs a skilled workforce to meet its goals. 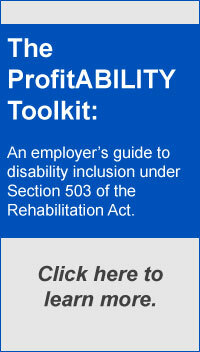 Effective job accommodations enable you to hire and retain talented employees with disabilities. We can conduct individualized evaluations to help you and your employee identify reasonable accommodations. How can your team members sharpen their customer service skills for clients with disabilities? How does an inclusive workplace foster greater morale and productivity for employees of all abilities? We offer trainings and workshops to help your staff answer questions like these and increase their knowledge. Comprehensive written report: You will receive a comprehensive written report that details the outcome of the review, recommendations to increase your organization’s accessibility, and the resources to help you make improvements. Individualized evaluations: We can conduct individualized evaluations to help you and your employee identify reasonable accommodations. Whether the best solution is a type of assistive technology or device, a modification to the work environment, or a change in the work process – we can help you set up and incorporate the accommodation into the workplace. Customized employee trainings: Trainings are customized to meet your organization’s needs and can include topics like disability awareness & etiquette, disability employment policy, and technologies to benefit your employees and visitors.